One notable about Wednesday’s action is that the Quantifiable Edges Capitulative Breadth Indicator (CBI) reached 10 for the 1st time since November of 2012. In the past I have shown a fair amount of research demonstrating CBI levels of 10 or greater have generally been enough to lead to a market rally within a few short days. 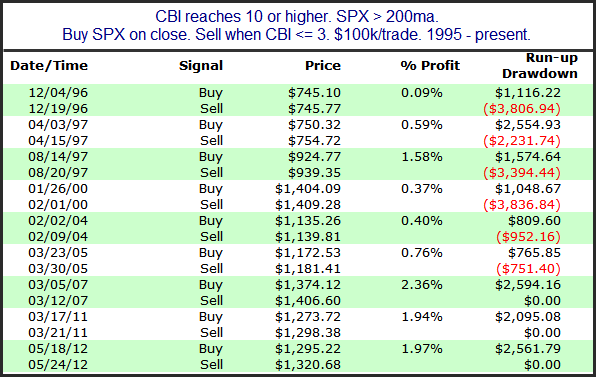 One simple strategy I have shown in the past that could take advantage of a high CBI is to purchase SPX when the CBI reaches 10 or higher, and then exit this trade when the CBI gets back down to 3 or lower. CBI history is available back to 1995 (and Quantifiable Edges gold subscribers may download it directly). Results below show how this strategy would have performed from 1995 – present. As you can see, results have strongly favored the bulls. A very high percentage of the instances would have led to winning trades, and overall gains have swamped overall losses by over 10x. Another thing to consider it the market’s long-term trend. Personally, I have found that relatively strong selloffs during long-term uptrends are substantially different than relatively strong selloffs during long-term downtrends. In other words, CBI readings > 10 have occurred under different conditions and led to different kinds of rallies depending on whether the market was trading above or below its 200ma. Below is a listing of all 9 previous instances above the 200ma. As you can see, instances above the 200ma have been more reliable, but less powerful. The average trade under these circumstances is just over 1%. And the largest winning trade was 2.36%. But the average trade when below the 200ma has been 3.2%. This is larger than the largest below the 200ma, and nearly 3x the average. So I believe it is important to make this distinction when setting expectations for the bounce over the next few days. While the bounces have not been as strong, the drawdown has been much more controlled under these circumstances. The largest drawdown so far has been less than 4%. Of course nothing is certain, and new history is constantly changing the odds. But as far as short-term indicators go, the CBI is one of my favorites for predicting a short-term bounce.